You might already see it in plenty of movies where the hypnotist asks his subject to stare at a small object hanging from a string. “You are getting sleepy,” he intones as the eyes of this person follow the pendulum’s trajectory back and forth. Soon the helpless subject is under hypnosis. 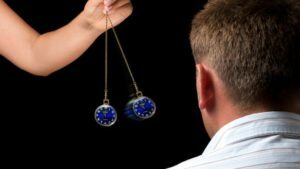 Despite the movie-house era stereotypes, pendulum readings are becoming one of the most popular forms of psychic readings today. They require a few simple objects and must be operated with consistency. 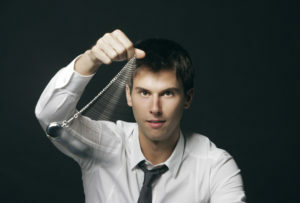 A pendulum is simply a small weighted object hanging from a string or wire. The object may or may not have significance to you. It could be a nut or bolt you find on the sidewalk. It could be a diamond ring passed down to you from your great-grandmother. A small object no larger than an inch in diameter is perfect. Attach a string to this object. The string should be about a foot long and thin but strong; a wire or fishing line is great. The goal of the string is to be as invisible as possible with no chance of breaking. Once you have assembled your pendulum, practice the art of establishing its motion. The pendulum should swing across the field of your vision. It should never go out of sight. Hanging at arm’s length from your face, rock the pendulum back and forth a few times until you find a way for it to arc from side to side at a slow steady pace. Once you have established a steady swinging movement, the next step is to visually focus on the space of the pendulum. The rhythm of your conscious mind following that object in space repeatedly lets you slowly release the tensions and distractions of daily life. The goal of the pendulum is to stoke your intuition. Through intuitive awakening, your psychic senses become sharper and more accurate. It is a simple process of being absorbed by the constant motion until the repetitive rhythm has so relaxed your mind that the future unfolds like a complex puzzle solving itself. Performing a pendulum ritual while on vacation is a fantastic way to maximize the psychic potency of an ordinary pendulum reading. When we are away, it is much easier to remain alone and undistracted in a quiet and relaxing space, be it in your hotel room or on the beach. Plan ahead and book a hotel that advertises itself as a peaceful retreat or is known for its seclusion. Try the vacation pendulum reading a few times a day. This ritual is better for awakening psychic sensitivity than for resolving a specific question. You are more likely to have psychic revelations after doing this ritual and will increasingly become more prone to having them. If you can organize your day as such, performing a pendulum reading daily at exactly the same time and in the same place is a powerful ritual. This ritual allows for investigations of a pressing question. If you can perform the ritual daily in a disciplined adherence to the timing, you will find quick and clear answers arise when you fixate on specific, focused questions at the beginning of the ritual. Perform the ritual if you are having a difficult time concentrating on a psychic reading you are receiving via the phone or internet. As you concentrate on the pendulum, the words of your psychic reading will penetrate deeper. The pendulum’s visual preoccupation creates a space of intense concentration. The clarity of your psychic’s message will astound you after trying this a few times. Before technology allowed for psychic readings over the phone and internet, the norm was to have one’s psychic hold the pendulum as you worked to reach a point of clarity and reception. This is still popular and gets great results. A psychic knows how to instantly access the power of the pendulum. You can just relax and focus on your question while your advisor enters a meditative state. As you get familiar with the weight and physical presence of your pendulum, you may tire of holding it in your hand. The value of hand-held pendulum readings is that they can rarely go on for more than ten minutes. Your arm naturally tires and breaks the rhythm of the pendulum. Fatigue is a good thing in this context because it allows you to have a finite amount of psychic space, drawing a boundary. Limiting your psychic space allows you to gain clarity and then move on to the next thing. Once you have established a regular Pendulum reading, mounting your pendulum on a doorway or a mantle, will allow you longer, deeper attempts at expanding that psychic space you have established. But be aware that the longer you stay with the pendulum, the more likely your reading will suffer from the cloudiness of fatigue. 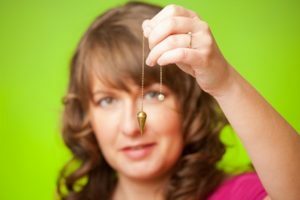 A pendulum reading makes you more open to a psychic reading and is great for enhancing your psychic powers within the unfolding of your own personal narrative.